Hello there!! 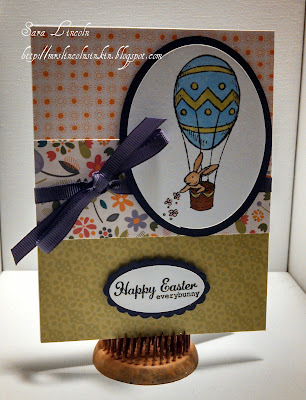 Today's card is a fun and vibrant Easter card using a few different DSP's and a fun little Easter image from the set Everybunny! Have i mentioned lately how much i love this set? It is an older set but you know what they say... an oldy but goodie!!! For my background i wanted the card to be "fun" so i decided to go with 3 different patterns of DSP. One thing i love about doing cards like this is that your DSP doesn't always have to perfectly match...you can play around with fun different designs, patterns and colors and somehow, don't ask me how, but it always seems to work. At least i think that it does!! A quick reminder before i head out for the day, don't forget that Sale-A-Bration is only on until the 22nd of this month, that means that there is just a little over a week where you can still earn free goodies with every $50 you spend (before tax and s/h). Click here to check out the complete brochure of SAB!! !